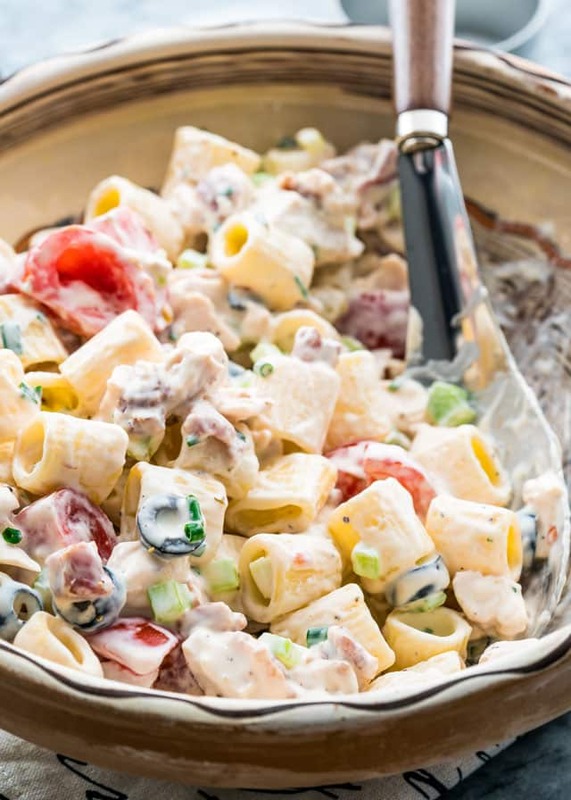 This Chicken Ranch Pasta Salad is perfect for a BBQ, a picnic or a lunch. 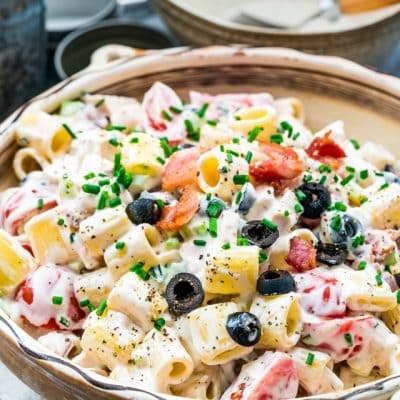 Loaded with chicken, bacon, tomatoes and olives and smothered in a creamy ranch, mayo and sour cream dressing, this will be your “go to” pasta salad this summer! Don’t you feel like summer is going by too quickly? It sure feels like that to me. I love summers too much, partially because they’re short here, but mostly because I love wearing flip flops everywhere. You might think that’s a weird reason, but hey that’s me. To make me feel all summery, if that’s even a word! I made a pasta salad for you, my friends, because I feel that a good pasta salad is like the quintessential summer salad that’s perfect for all occasions. 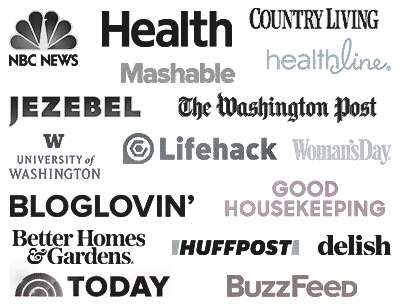 I also realized that I don’t have quite that many pasta salads on my blog here, although I spend quite a lot of time each summer trying to come up with great pasta salad combinations because it really is one of my favorite things to eat in the summer, next to ice cream. Ranch dressing, while it may not be the healthiest dressings out there, is my favorite, so it’s a no brainer to make a pasta salad with it. I wanted this salad to be extra creamy, because I’ve made pasta salads in the past where you, my dear readers, have mentioned that they need more dressing. 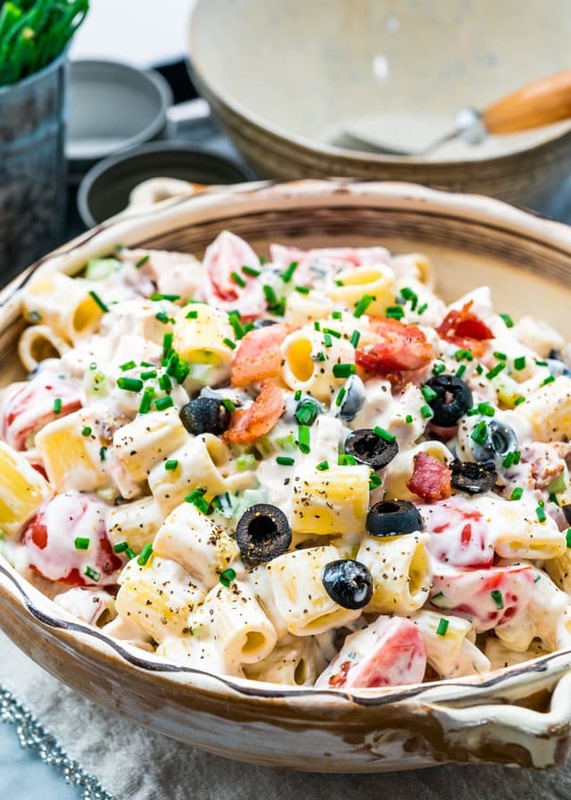 So this pasta salad, has plenty of that creamy ranch dressing, combined together with sour cream and mayo. But the reason I love this salad so much is because it’s loaded with chicken and it has one of my favorite all time ingredients, BACON. Yes, it’s true, bacon does make the world go round. The other ingredient that I added and love in this salad are the tomatoes because it adds a burst of freshness to the salad. 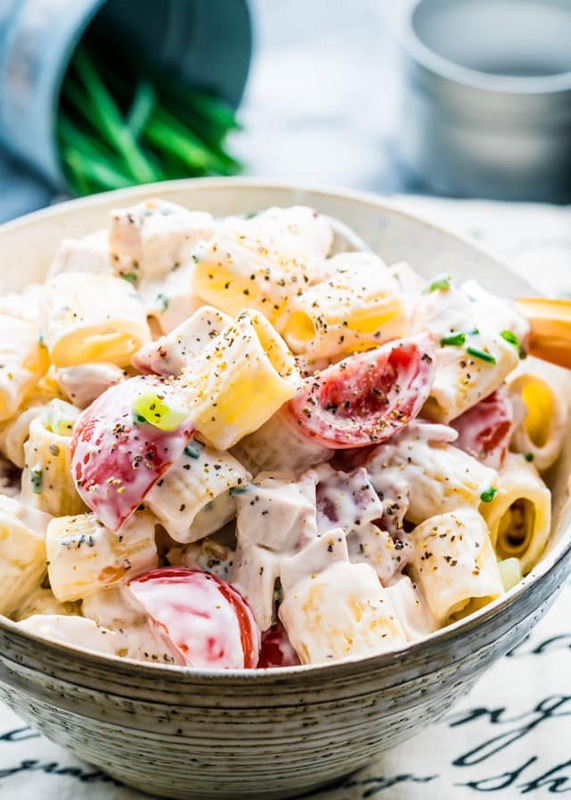 So there you have it, creamy, fresh, bright and balanced, my favorite pasta salad and the only salad I want to have for the rest of the summer. Check out some of my other pasta salad recipes to keep your summer going! What ranch dressing do you use ? It’s hard to find a good one. This was a great way to use some leftover chicken. It was tasty and hard to stop eating. The only thing I did differently was add a small cucumber, scallions, and some white onion. I didn’t have any bacon to add but it was still a delicious salad. Hi Jo! What ranch dressing do you recommend using in this recipe? This look so delicious, this is the best of the best salad I have ever had. 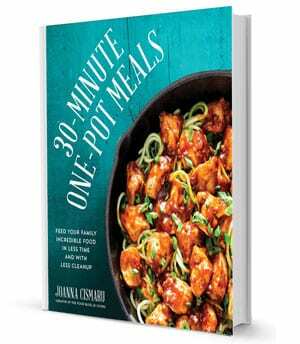 Will be making this a recipe for my family. Hi Jo. I have been searching for a creamy pasta salad and you have delivered one. It is sad, but true, that many pasta salads are on the dry side, especially leftover. This one certainly fixes that issue. I have the same issue with potato salad, it must be creamy. So glad you like the Chicken Ranch Pasta Salad as much as we do. Thanks for posting your comment and being a part of our Jo Cooks community.